Working with Cox Architects HASSELL has developed a new grandstand design that is contemporary yet sensitive to the heritage features of the Oval. The $95 million project will increase the venue’s capacity from 30,000 to 36,000 and includes major upgrades to player and spectator facilities. 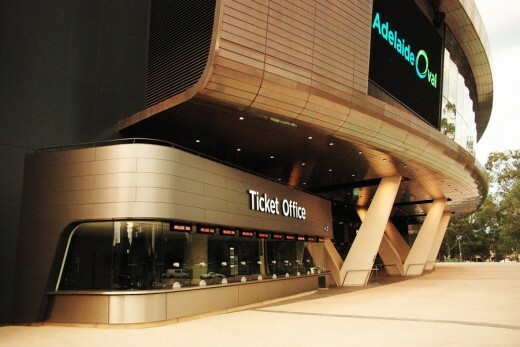 Interlocking levels provide easy access to internal and external facilities, with magnificent views across Adelaide Oval to the northern end of the ground. The four-tier western grandstand will stretch from the Bradman Stand in the south to the grassed hill in the north-west. The stand will provide seating for 14,000 spectators and ensures views from the bars and dining room as well as comprehensive upgrades to the venue’s amenities, storage and operational infrastructure. Unlike other major sports grounds in Australia, Adelaide Oval has preserved its historic and aesthetic charm. The new western members’ grandstand respects this by conserving the historic George Giffen Stand and its heritage arches; that along with the Edwardian scoreboard are listed on the State Heritage Register. Thee arches will become part of a new western promenade providing access to the stands. The promenade will include two undercover fast serve kiosks at the north and south ends, two centrally located serve-and-go bars, an at-match members’ inquiry hub, improved ATM facilities, brand new male and female toilets as well as a fully equipped unisex parents room, kitchenette, feeding lounge, baby change and toddlers room. The Oval’s familiar short square boundaries and deep pockets will be reshaped, bringing fans in the north-west and south west corners of the ground 12-15 metres closer to the action and removing the “impossible kick” for goal from the pockets. Increased shade is achieved by an expansive, highly engineered, freespan column-free “diagrid” roof. In accordance with the requirements of the Adelaide Oval Conservation Plan, the design of the new stands specifically preserves open space and grassed mounds between buildings and permits views into and out of the grounds. Other highlights include new player change rooms and viewing areas, a large 600 cover dining room, a 45m long bar and an elevated outdoor spectator eating area with views over Adelaide Oval No. 2and the western parklands. The new stand is the latest in a long line of HASSELL architectural contributions to the Adelaide Oval, that includes the Sir Donald Bradman Stand and the Chappell Stands completed in 2003, and the recently opened Bradman Collection Museum. This is most expansive upgrade in the Oval’s history. It is essential to maintaining the Oval as an international cricket ground and ensuring we can compete in the international market to attract sporting and entertainment events to Adelaide”, said SACA Chief Executive, Mike Deare. Work will begin on 10 March 2009 following the West End Redbacks final Weet-Bix Sheffield Shield match of the season against the PKF Tasmanian Tigers and is scheduled to be completed by November 2010, in time for the Ashes Test series. Visitors to the newly redeveloped Adelaide Oval – one of Australia’s most iconic sports venues – will be greeted by a dramatic curved form over the main entrance. The redevelopment involves new south and east stands, related to the previously redeveloped western grandstand. It provides 50,000 spectator seats and ancillary facilities for cricket and Australian Rules football, as well as other sports and entertainment.